The Last House on Mawella Beach, Sri Lanka. Few tropical retreats seamlessly marry the relationship between indoors and outdoors like this one. 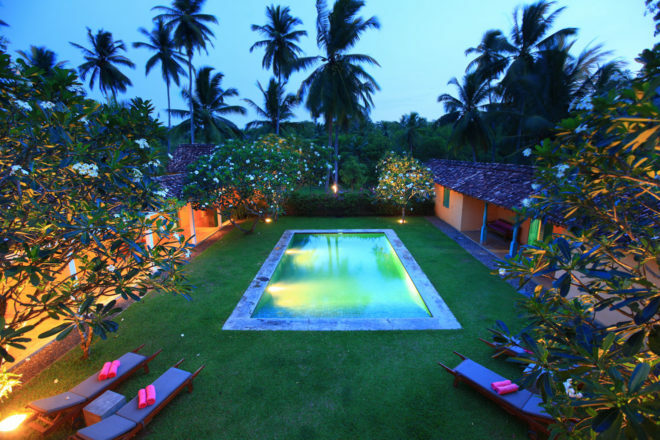 The last residence conceived and built by the late Sri Lankan ‘star-chitect’ Geoffrey Bawa, who devised ‘tropical modernism’, The Last House is now a charming six-room resort facing a crescent moon cove on Sri Lanka’s southern coastline. Perfectly interplaying light and breeze – there is no air conditioning. Nor are there TVs, but there is a library full of games and books, and a beautiful big pool. The brightly coloured house is styled with Sri Lankan antiques and four-poster beds, plush sofas and old-fashioned planter’s chairs. Sensational Sri Lankan curries and grilled fish are prepared on demand and according to what the fishermen bring back each morning. It is intimate, simple and affordable; book the whole house for complete privacy. Visiting Yala National Park nearby, a 979 square-kilometre park with wild elephants, aquatic birds and one of the world’s highest concentration of leopards.